Hippie clothes. Bohemian clothing. Artsy clothing for expressive women! Retro Miss presenting classic gypsy hippie chick bohemian shabby chic styles for creative women. Handmade boutique styles at affordable prices. 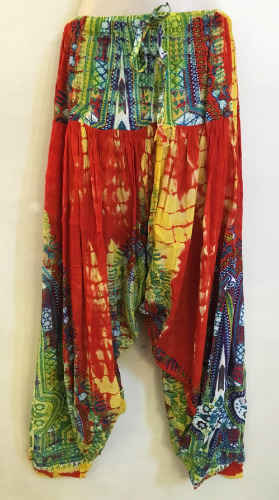 100% Rayon Harem Pants with drawstring waist and 5 button closure at pant cuffs. Gorgeous tie dye over dashiki print fabric. These pants are loose cut slouch style. Made from lightweight rayon, these pants would be great for yoga, dancing, dining out, or the beach. These pants come in both regular and plus size. Be sure to choose the correct size from the drop-down menu at checkout. Because of the handmade nature of these garments, sizing varies. The measurements here represent an average measure of this garment. Fabric has some stretch and very comfortable. Check the measurements below.